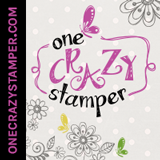 Lora's Crazystamper Blog: Flowers, Flowers and more Flowers! This month's theme on the OCS DT Blog is Flowers...so I thought it would be cool to play along with the gals. If you have a moment come check out the challenge and play along too...you could win a prize! You can find the challenge HERE! I have Skippydee and Indiana from Whimsy for you. If you are looking for the great image you can find it HERE! I have used the Graphic 45 Secret Garden 6 x 6 pad which I'm totally in love with, you can find that HERE! Hope you enjoy today's post, have a wonderful day!